Containers provide less protection for your plants than if they were planted in the ground. The upside is that they are portable. 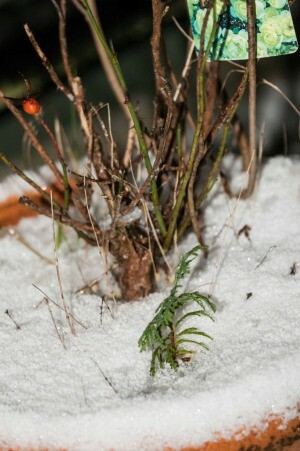 This is a guide about preparing container plants for winter. I live in a townhome and have a porch and patio to display flowers. Each fall before it freezes I bring a bunch of my plants inside, pots and hanging baskets of geraniums, especially. I place them around a window in a spare room that gets pretty good light. They drop a lot of leaves at first, but gradually get accustomed to the indoor conditions. In the spring I take them back out again. I save so much money by not having to replace these plants every year. This year I started nasturtium, zinnia, and vinca from seed in several pots and they turned out so pretty - the cost of the seeds is small. Every year I have a super nice display of flowers and it costs me hardly anything! For most of us, the first hard frosts of fall mark the end of container gardening season. Here are some tips for tidying up your dead or dormant plants, moving your favorites indoors, and cleaning up and storing your containers for the winter. If your containers include tropical plants or tender perennials that you plan to overwinter indoors, start getting them used to their new environment well in advance of freezing temperatures, (and before you turn on your home's heating system). Water them well and set them in a shady, protected spot for a few days before bringing them indoors. During this time, check them over carefully for signs of pest problems and treat them with an insecticidal soap if necessary. Can the plant be easily replaced? When space is limited, plants that are difficult to find, expensive to buy, slow to grow, or highly sentimental should take priority. How much space will it need? Large plants take up more room. Taking a few cuttings at the end of the season is a great way to preserve larger plants and while saving some space. Which plants would you enjoy having inside for the winter? If a plant offers pretty flowers (begonias), colorful foliage (coleus), or a nice fragrance (rosemary), it may be worth the effort of overwintering it indoors. What are the plant's growing requirements? You may actually have more space than you think when you consider that not all plants need a warm, sunny space to survive the winter. For example, begonias can get by in a bright, but cool spot, such as an enclosed porch. Some tender perennials, like cannas, go totally dormant. As long as they don't dry out, they will survive nicely in a frost-free corner of the garage. In areas where winter temperatures are well below freezing, extra steps are needed to protect the plant's roots. This may mean sinking containers into a trench filled with sand, soil, or compost, or moving them to a sheltered spot next to a building and covering them with several inches of mulch. Containers that are too large or too heavy to move can be wrapped up in the insulating blankets made for hot water heaters. The blankets are easy to cut down to size and they can be reused year after year. Look for them at home centers and hardware stores. One of the most dependable options for protecting hardy perennials is to remove the plants from their containers and plant them in a holding bed until spring. An alternative is to bring them into an unheated garage or porch, where they will stay cool but not frozen. In high wind areas, consider spraying container-grown evergreens with an anti-desiccant product to help prevent their foliage from drying out. Soil expands as it freezes, and even the best containers will crack if soil is left in them over the winter. Your containers will last much longer if you empty them out and store them inside. If they are light enough to move, dump any remaining plant debris and potting soil into your compost pile, and scrub containers with a stiff brush or scouring pad to remove any remaining dirt. Finally, rinse them with a solution of one part bleach to nine parts water and let them air dry. Containers should be stacked upside-down in a frost-free environment like a basement, garden shed, or garage. 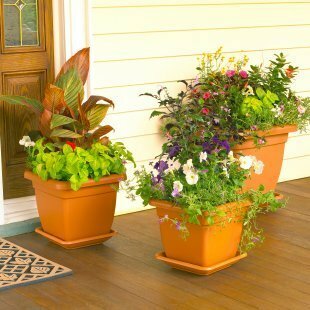 Weatherproof containers (not ceramic or thin-walled terra cotta) can be turned over and left outside, providing you remove the potting soil. I want to grow mint in a container outdoors above ground, but I'm concerned about winter storage. There is no room in the apartment, will it winter in a shed with protection? If so, what steps can be taken? Possibly. Maybe nestle the pot in a bin of straw or rags for extra insulation? Do you have room for a 4-inch pot on the windowsill this winter? Mint is very easy to root. I'd suggest you hold a cutting over inside the first winter as backup till you know if the shed storage will be sufficient. It's been my experience you can't kill mint. That's why I keep mine in a container too. It just takes on a life of it's own and look out! This guide is about protecting pots and planters over the winter. 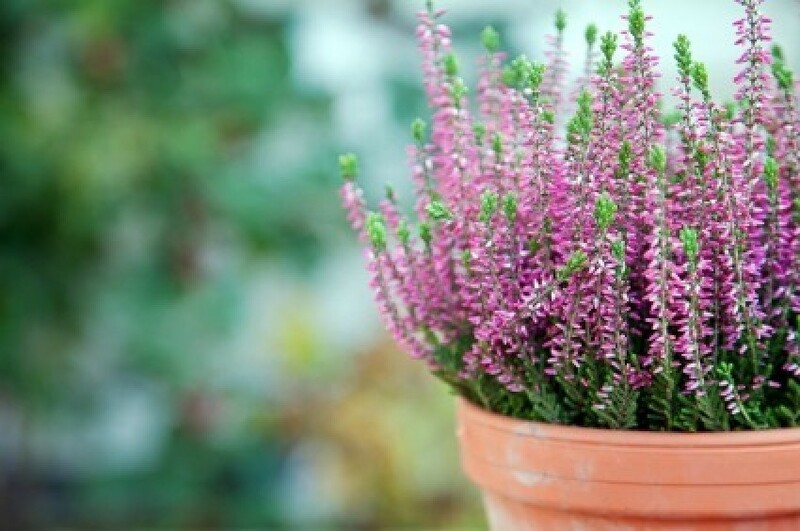 You may want to keep some of your container plants and pots for next spring.